We've been learning about silly stories around here. When I was growing up, my dad would tuck my brother and I into bed with a prayer, a Bible story and a silly story which, of course, he would make up. I remember some of the stories. Particularly the one about the boy with the ear so full of wax that the entire town was set up with candles for life! At any rate, it's good family tradition and therefore must be passed along to the next generation. Bookworm1 has been delighted with our silly stories of late. The other day he spoke words that were magical music to my ears: "Mommy, I will tell YOU a silly story!" What pride. What a surge of hope I felt. What glorious anticipation! WHAT story would I be told by my two year old son!?!?!? Bookworm1: "Once upon a time there was a tomato named poop." Bookworm1: (laughing) "Yes. A potato named poop." Bookworm1: "Poop hopped into a tree store and he found some gold." Mommy: "He found gold!??! What did he do?!" Bookworm1: "I don't know. And it was very dark." Mommy: "It was very dark!? Was he very scared?" Bookworm1: Let loose a chorus of "I don't knows" indicating that story time was over. Let that go on record as his first "Silly Story." Bookworm1: "Once upon a time there were three little pigs." Mommy: "What were their names?" Bookworm1: "Umm....pig. And pig. And pig." Mommy: "They were all named pig? That's pretty silly!" Bookworm1: "And then there was a big bad wolf." Mommy: "What was his name?" Bookworm1: "Wolf. And he thuffed and thuffed and *insert blowing noises* he BLEW MOMMY'S HAIR DOWN!!!" Or, perhaps you might say (and I might hope) this is only the beginning. I would love my son to be a good story teller (in all the correct ways!). It's a marvelous skill to have and I'm delighted he connects with the world in such a goofy little way. Now, if we could just leave poop out of it . 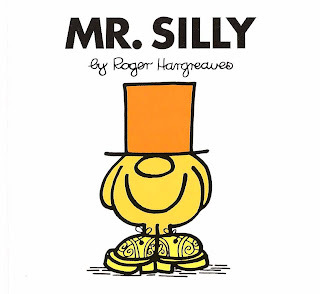 . .
For some great Silly Story prep, you might check out the Mr. Men and Little Miss Books which I reviewed an incredibly long time ago over at 5 Minutes for Books. Just a tip from me to you. 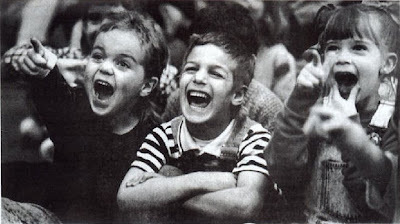 There is just something about boys -- poop and gas are the funniest topics ever. LOL! Although I see from the comment above maybe it's not just a boy thing. Much to my husband's (and father-in-law)delight my guys are into telling corny jokes. They don't fully understand the concept of a punchline so their original jokes don't usually make sense. But we all laugh anyway. My hubby has a joke book that my oldest has taken as his own. It stays on the shelf over his bed and on rainy days (like today) I find him reading the jokes. I never know when he'll come out with one. Corny jokes- it's our family tradition. Too cute. He is on his way. My favorite is definitely the wolf story.